The global fashion industry was worth US$2.5 trillion in 2017, and it’s expected to grow in the rate of 5.5% for the next five years, according to the latest report by McKinsey and the Business of Fashion report. Apparel manufacturing accounts for US$658 billion and its annual growth is expected to rise by 4.8%. Understandably, the growth of the industry depends on the disposable income of the consumers. Currently, many countries struggle with the above average inflation due to the rise of the dollar. However, one country which enjoys the fruits of this current market condition is the USA. Essentially, the US retailers have more buying power due to the high value of the dollar. Wages of many employees have risen over the last 24 months, increasing the disposable income of the average household. The unemployment level in the USA is at all-time low. Current spat Trump administration have with China has resulted in a 10% rise in the duty imposed on Chinese made textiles, handbags and hats. It is important to note that, currently 40% of clothing items and 70% of shoes sold in the USA, carry the made in China label. 10% rise in the tariff may be the blessing in disguise for the apparel manufacturers in South Asia. Question is, are they ready to grab the opportunity? The manufacturers in South Asia, who are quick to understand the changing market dynamics are the winners. For some time now, the wages of Chinese labor were increasing, and many companies would not be able to lower the FOB China cost of the products to compensate the rise of 10% tariff. This pretty much gives a much-needed break for the South Asian manufacturers to be competitive. Most of the US retailers and the whole sellers would be looking to maintain the same level of inventory and possibly more to take advantage of the increasing demand from the domestic market. Increased tariff from China will certainly make them re-think of their sourcing and supply chain strategy. Being visible and offering quality products would be the best strategy to grab a share of the pie. How to be visible is the age-old question many manufacturers often asked. The easiest and the quickest answer is to participate US-based trade shows. There many to go around but the most effective due to a sheer number of participants are Magic- Las Vegas, Texworld and LA Fashion Market. Many thousands of potential buyers walk past the stalls. Having an eye-catching branding and some great products would certainly get them to stop and inquire. Another great strategy to increase the volume of the business with your current buyers is, to offer them new products. Traditionally, most South Asian manufacturers are just s, large-scale tailors. Only value addition they do is to stitch the fabrics together as per the given tech pack and the sample by the buyer. It is important to take a step further and understand the latest fabric offerings, trims & accessories, wash techniques and so and offer to the buyers. Even if they do not take the product in whole, they may like the new fabric you brought in to their attention or the new washing method you suggested. They would easily find a use for it in the next collection and more than likely to place the order with your company. 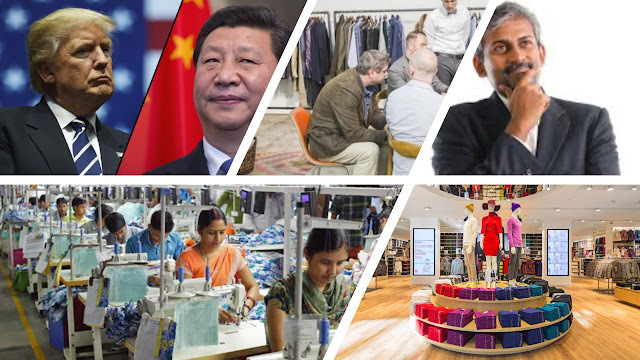 While working on improving the product developments and the visibility, it is worth pressurizing respective governments to improve the trade relationships with the USA through apparel trade associations. Most of the South Asian countries have a warm relation with the USA. Current GSP program expires in soon and better to get it reauthorized so your companies could continue to enjoy the duty benefits it offers. Know more about the Generalized System of Preferences (GSP). About the Author: Dr. Charm Rammandala is the founder & CEO of IStrategy USA. Currently, he is the Head of Production and Global Sourcing at VOmax GDMC LLC which is one of the oldest sportswear company in the USA. He counts over two decades in the fashion supply chain in diverse roles as Lean Manager and Model himself. He is an expert in rolling out programs in Lean apparel manufacturing and Sustainable labour costing. His former positions included being the first Lean Technologist at George Sourcing Services UK Ltd. Opportunity to increase the USA market share, raise in import duty and GSP.